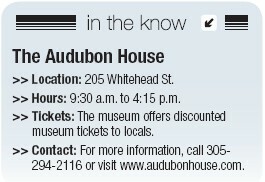 It’s midway through the tour of Key West’s stunningly pretty Audubon House and Tropical Gardens that the truth comes out: John James Audubon — famed naturalist painter, whose lifelike paintings of bird portraits line the walls of the museum — never actually lived in the Audubon House. But don’t let this spoiler keep you from visiting; indeed, a visit to the Audubon House offers so much beauty, charm and historical interest, you’ll be left feeling only that it was Audubon’s loss that he was never able to inhabit such a magical place. Amassing a fortune from treasure gathered from the ruins of shipwrecks might seem like a job description for a storybook pirate, but in 19th-century Key West, it was a lucrative and respectable way to make a living. The busy passage between the Eastern Seaboard and the Gulf Coast was a dangerous place for ships to sail, and each year saw many boats wrecked on offshore reefs during the frequent storms that pummeled the area. “Finders keepers” might not mean much today, but for those in the wrecking industry of Key West, it was law. When a ship ran aground, the first man to reach the boat became the “wreck master,” who — after saving the crew and passengers, if possible — directed the salvaging of the ship and its cargo. Back on land, the recovered haul was auctioned off, with the wreck master taking the largest cut of the profits. It was a dangerous, highly competitive and regulated industry, the spoils of which helped solidify Key West as the richest city in the country by the mid-1800s. For Capt. John Huling Geiger, a maritime pilot whose shipwrecking success had made him one of the richest men in the Florida Keys, such wealth demanded a home of appropriate grandeur. In 1846, after the rest of the island was mostly flattened in a hurricane, Capt. Geiger chose a prominent lot on which to build his family’s new home — a lavish American Classic Revival mansion of tropical wood at the intersection of Green and Whitehead streets, with an unobstructed view of the ocean (and any new potential shipwrecks). 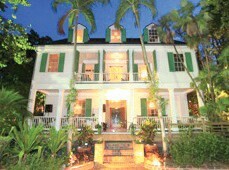 It was a grand, busy estate encompassing 6 acres, home to Capt. Geiger, his wife, his children, and a number of slaves who, in addition to domestic chores, were made to assist in the wrecking business that fueled Geiger’s wealth. For over a century, Capt. Geiger’s home remained in the family’s possession, until Capt. Geiger’s great-grandson, Capt. William Bradford Smith, took up residence. Smith, a Key West Harbor pilot, lived in hermit-like seclusion without indoor plumbing, electricity or cooking facilities, and by the time of his death in 1956, the house had fallen into ruin. Slated for demolition, it was saved in 1958 by Mitchell and Frances Wolfson, who were compelled to purchase the property after hearing it was destined to become a gas station. The Wolfsons had heard the same folklore that speculated James Audubon might have conceived many of his bird portraits during a visit to the gardens of Dr. Benjamin Strobel, whose home was located on the property where the Geiger family mansion would later be constructed. The Wolfsons began a two-year process of painstaking renovation, the first historical renovation of its kind in Key West, at the end of which marked the rechristening of the Geiger home as the Audubon House Museum. They filled the house with antiques, including many items from the Geiger family, as well as numerous original hand-colored lithographs by Audubon. Today, Key West is known for having one of the most colorful and well-protected historical districts in the United States, with the highest density of historic frame buildings in the nation. Yet few who visit know that it was the Wolfsons’ renovation of the Audubon House that began this now-priceless movement to protect and preserve the island’s oldest architecture. To this day, the property is cared for through the Mitchell Wolfson Trust, and remains a reputable dealer of original Audubon work. The three-story home is filled with precious antiquities and, of course, with Audubon’s work, as well as information about the artist’s life and career. An acre of lush tropical gardens surrounds the home, featuring hundreds of orchids, a koi pond and a replica of the property’s original 1850s outdoor kitchen building.